U-1 Unemployment Rate - What Does It Mean? What is the "U-1 unemployment rate"? 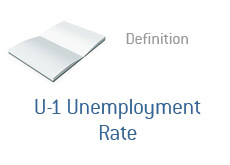 What is the "U-1 unemployment rate" helpful in measuring? Before we define the U-1 unemployment rate, let's quickly go over the two more popular unemployment rates - the U-3 and the U-6. The U-3 unemployment rate is the "official" government unemployment number. When you hear the unemployment numbers on CNBC, you are hearing the U-3 unemployment rate. The U-6 unemployment rate is considered to be a broader measure of labor underutilization. The U-6 rate includes some very large groups of people that the U-3 rate doesn't, including "marginally attached" workers and those people who have part-time jobs but want full-time work. The U-1 unemployment rate is completely different. -"persons unemployed 15 weeks or longer, as a percent of the civilian labor force"
This would be your long-term unemployed, as a percentage of the total civilian labor force. The U-1 unemployment rate was 3.0% (seasonally adjusted) in December of 2008, but has since grown to 5.9% in just one year.